Behind the Shrubbery is a dry, sandy area of my garden, where plants have to be extra tough, preferably a bit 'weedy', to survive. So I've let Periwinkle cover the ground, and in the space above there's a mini-forest of Genista (a hybrid exotic broom). I bought two (bargains at one dollar each) of these shrubs some years ago. In New Zealand 'broom' is a noxious, undesirable shrub, but not so Genista x spachiana 'Yellow Imp'. However, my originals have produced masses of seedlings, which have in turn produced masses of seedlings. Hmm... The wild broom is obviously still in there, straining to escape! 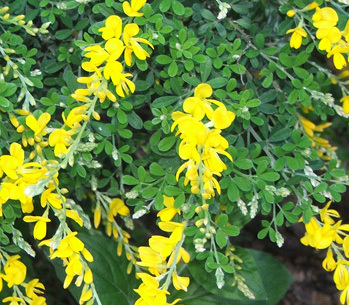 'Genista x spachiana 'Yellow Imp' is a fast growing, tough exotic hybrid broom with small dark green trifoliate leaves. It produces for long periods during late spring and summer masses of small, fragrant, golden, pea shaped flowers on slender terminal racemes up to 10cm long. In New Zealand’s conditions it has a lifespan of 5 to 10 years and will obtain a height of 3m and a width of 2m. The size of the Genistas in this web-site's photographs are impressive - my own shrubs are sheltered by tall trees, and as a result rather more subdued. But the word 'dwarf' on Little Imp's plant label is a nonsense. 'Little Giant' might be a better variety name!